As we were seated at our table for the first dinner of our tour of Greece and its Islands with Perillo Tours, we were, needless to say, excited about the prospects of seeing some of the most famous sights in the world. As the evening sky grew darker and the illuminating lights began to take effect, we were presented with a stunning view of one of the most iconic sites of all time – the Acropolis. Dining at the wonderful Dionysos Restaurant afforded all of us front row seats to the illuminated wonder of the Parthenon. And this was just the beginning of what would prove to be a magnificent excursion through Greece and its Aegean jewels. 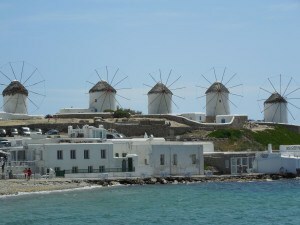 We always had a desire to visit Greece and some of its most popular islands. 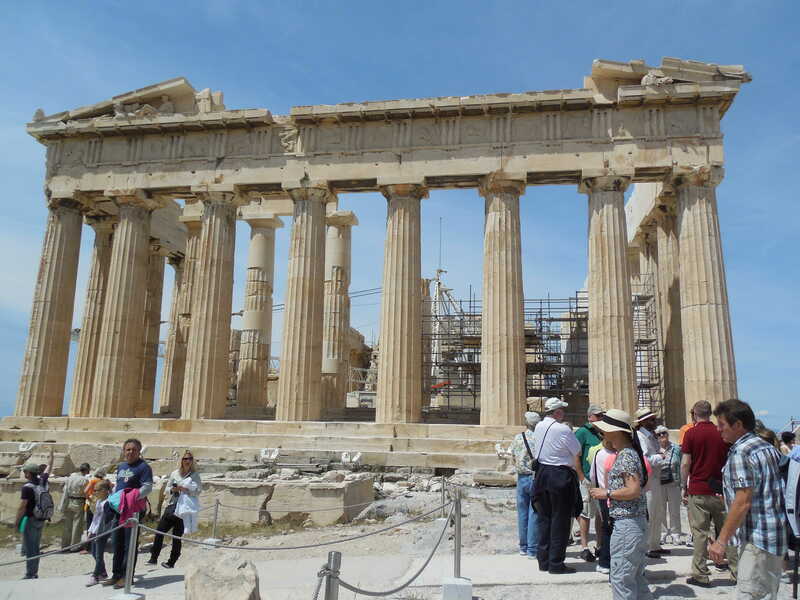 Touring some of the famous archeological sights such as the Acropolis had always been a “must see” for us. 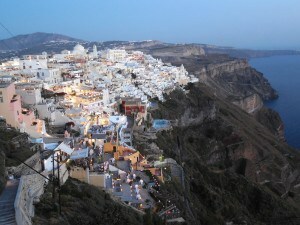 But we also wanted to experience some of Greece’s romantic islands – ones with such alluring names as Santorini and Mykonos. We were familiar with the Perillo reputation for conducting outstanding tours of Italy, and we were certainly not disappointed with Perillo’s “Luxury Greece” tour. Travel between islands was hassle-free, as we took high-speed ferries with business class seating. Travel from Crete, the last (and furthest) stop on the tour, to Athens was via a short, one-hour flight. All baggage handling was included, making for a stress-free vacation. Keeping true to its claim for luxury accommodations, meals, and sightseeing, our Perillo tour included top hotels (all 5-star rated), delicious meals at some wonderful restaurants, and very informative sightseeing excursions of some of Greece’s most famous archeological sites. We arrived in Athens a day early so that we could adjust to jet lag and be ready for the first day of our tour. What a great choice, as we stayed at the same hotel, the Grande Bretagne, as the tour was scheduled for. The hotel offers first-class accommodations, and the rooftop restaurant affords stunning views of the Acropolis. Adjacent to Constitution Square (Syntagma), the Hotel Bretagne is located in a vibrant part of the city and within easy walking distance to the Plaka district, an area that is alive with activity because of its many restaurants, cafes, and shopping venues. Also within easy walking distance is the charming Anafiotika, the area at the base of the Acropolis with its narrow streets and flower-adorned apartments offering scenes similar to ones we would soon see on our visit to the islands. So, we spent our first day in Greece wandering the Plaka and Anafiotika, stopping at some wonderful cafes to sample some of the delicious baked goods and traditional coffee, while lingering at a sidewalk table to observe the lively scenes of the many passers-by and entertaining street performers. A perfect beginning to a trip we will long remember. 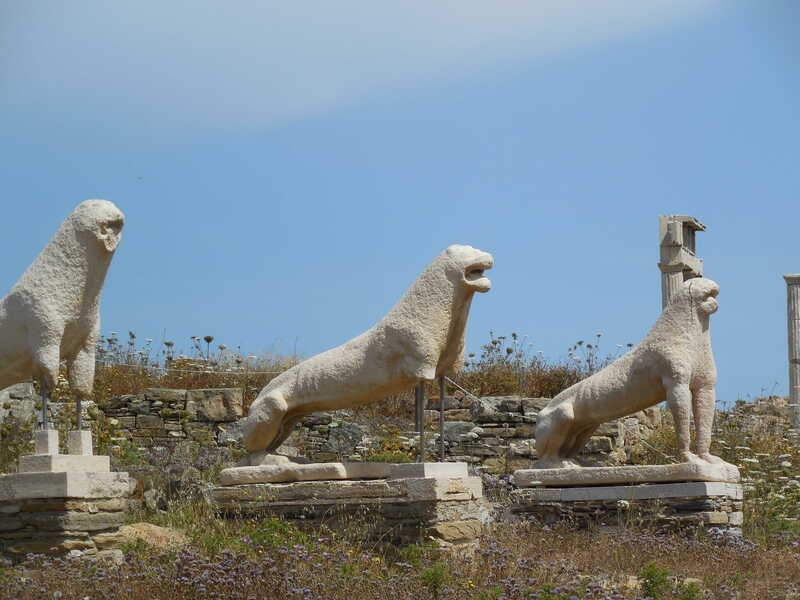 in Athens, the island of Delos near Mykonos, and the Minoan Palace of Knossos on the island of Crete. 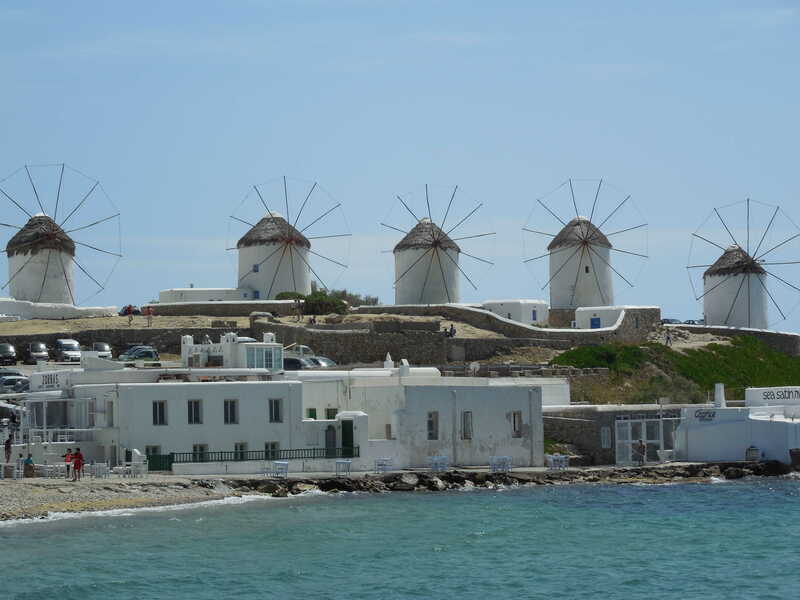 We felt that Perillo provided just the right amount of organized sightseeing tours combined with enough free time to either relax at our hotels’ pools or beach or explore and experience some of the unique villages on Santorini, Mykonos, and Crete. Strolling the walkways along the top of Santorini’s caldera through the villages of Fira and Oia offers views that are nothing short of breathtaking. We enjoyed a great day walking through the town of Fira and into the adjacent villages of Firostefani and Imerovigli continually mesmerized by the beauty of the quaint villages and the stunning views of the caldera. 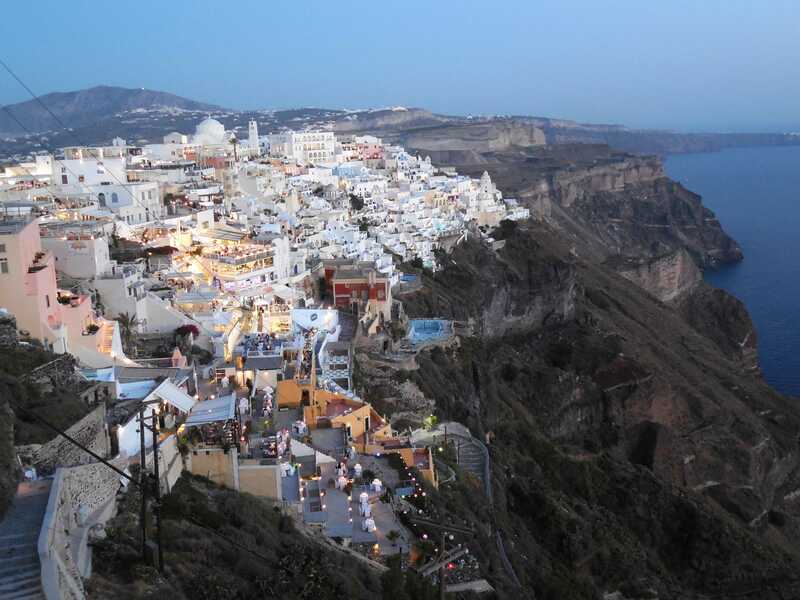 That evening, after a stop at a local winery and wine museum and the fortress village of Pyrgos, the tour visited the charming village of Oia to witness its renowned sunset. It was hard to believe that we were even more awestruck by the beauty of what has to be one of the most picturesque villages in the world. 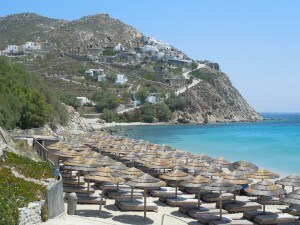 Imperial Hotel in Mykonos is perched on a cliff overlooking the beach at Elia providing outstanding views of the Aegean. The Aressana Hotel on Santorini is perfectly located in the town of Fira, literally just steps from the village’s main walkway and its views of the caldera, close to all the restaurants, cafes, and shops. 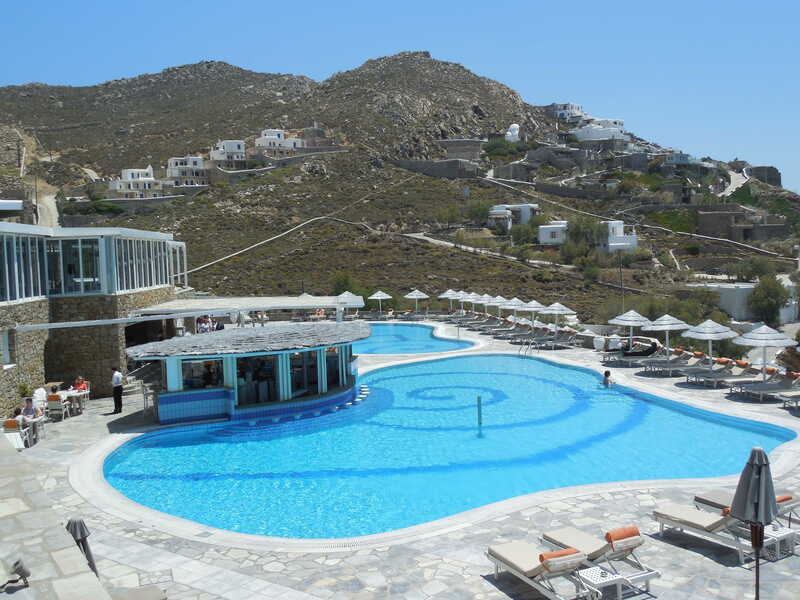 And finally the Porto Elounda Hotel on Crete is an expansive resort with private beaches, a 9-hole executive golf course, and beautiful views of the Aegean. Dining during our visit to Greece was a wonderful experience. The Perillo tour includes daily breakfasts, six dinners with wine, and three lunches – each of which was a treat. In addition to our first-night dinner at Dionysos, with the Acropolis as a backdrop, we enjoyed some outstanding dinners offering traditional Greek cuisine. On Mykonos, our group dinner at Koursaros in the main town was nothing short of an epicurean adventure, as the wait staff served what seemed an endless selection of dishes, one more delectable than the other, while they made certain to keep our wine glasses full. We enjoyed the fact some nights we dined at our own choice of restaurant, giving us the freedom to select a restaurant or café that we found especially interesting during our stroll through town. This was especially true of the days that we had a tour-provided lunch. Our three provided lunches included a superb meze lunch (meze is a meal of small plates or appetizers, such as the Spanish “tapas”) with Ouzo tasting at the beachside Vassilikos Restaurant at Kamari Beach on Santorini; a traditional lunch (again with an “endless” stream of courses) at the re-created Cretan village of Arolithos, where we learned to make tzatziki (herbed yogurt dip) and loukoumades (Greek donuts) and tasted the traditional Cretan drink of raki; and finally, a delicious barbequed lunch aboard the private catamaran, during our cruise around the caldera in Santorini. This full-day cruise, aboard a luxuriously comfortable ship offering ample shade, was a highlight of the trip. We cruised to a volcanic hot spring for a relaxing bath in a natural spa, a red sand beach, a white sand beach for some snorkeling, and finally along the base of the caldera for some fabulous views of the villages so precariously perched along the cliffs. During our entire tour we were escorted by a helpful, competent tour host who was very affable; her having been raised in South Carolina and living in Greece for many years made for fluent communication. For that matter, communication with just about everyone we met was easy, as English is required of all students in Greece. We don’t think that in our numerous travels we have come across any people friendlier than the many Greek people that we encountered. Most of our fellow travelers on this tour had been on a Perillo tour before, and every one of them felt that the “Luxury Greece” Tour was just as attentive to details and up to the high standards of their other Perillo tours. We certainly felt that this tour fulfilled our expectations, and we look forward to traveling with Perillo again in the future. Call 1-800-431-1515 or visit Perillo Tours for more information or to request a brochure about the “Luxury Greece” Tour or other Perillo tours to Italy, Hawaii, and Costa Rica. Disclosure: A small portion of this tour was provided by Perillo Tours. Regardless, everything we have said in this post reflects our honest opinions. ← The Amish in Delaware? Bikers know !